President Barack Obama awarded the Presidential Citizens Medal to 13 Americans this month, including Elizabeth Cushman Titus Putnam of Shaftsbury, Vt. The White House said the 40-year-old honor spotlights Americans who perform "exemplary deeds of service for their country or fellow citizens." The medal stands among the highest honors that a civilian can receive, and Putnam is the first conservationist to receive the medal. 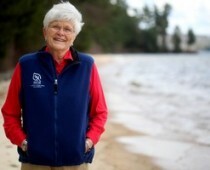 Devoted to preserving our nation’s public lands, Elizabeth Cushman Titus Putnam has inspired thousands of America’s youth to protect our natural bounty. Her vision to offer land restoration and maintenance service opportunities became a reality with the birth of the Student Conservation Association. Putnam receives the Citizens Medal for helping ensure that our nation’s treasured public lands are enjoyed by future generations. SCA provides college and high school-aged members with hands-on conservation service opportunities in virtually every field imaginable, from tracking grizzlies through the Tetons to restoring desert ecosystems and teaching environmental education at Washington, D.C.’s Urban Tree House. We are truly building the next generation of conservation leaders. Based in Charlestown, N.H., the association's menu includes national crews, community programs, conservation internships and conservation corps. Ornithology ranks among the most popular sub-categories in the expense-paid conservation internships. Thank you very much, Ms. Putnam.